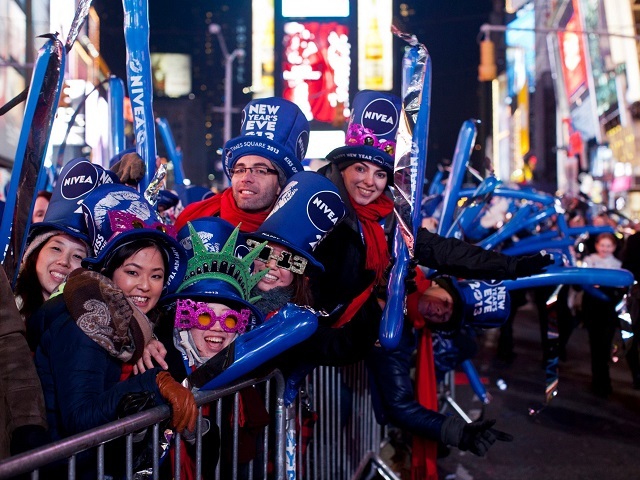 New York City’s Times Square is a ubiquitous icon of New Year’s Eve. While the Square has undergone significant transformations throughout its history, this year’s revelers will notice a new development: the first of five planned public plazas in Times Square opened last week. Photo by Anthony Quintano/Flickr. 1904 was a big year for the city of New York. The first underground subway system in the United States launched in Manhattan, the New York Times opened the second highest skyscraper in the city at One Times Square, and with it a timeless tradition was born. That year marked the first New Year’s Eve celebration in Times Square, where revelers commemorated the occasion by blasting fireworks off the roof of the building. Following a citywide ban on fireworks in 1907, the now famous 12-foot wide, 11,875 pound iridescently sparkling ball made its first appearance and has been a New Year’s Eve fixture ever since. Just last week, Mayor Bloomberg – along with Department of Transportation Commissioner Janette Sadik-Khan and Department of Design and Construction Commissioner David Burney – cut the ribbon at the opening of the first of five public plazas in the newly redesigned Times Square. The next four are set to be completed by 2016, marking the complete, permanent pedestrianization of Times Square. The Times Square project is one of 132 initiatives under PlaNYC, which also addresses transport, green infrastructure, public space, and other measures to make New York City more sustainable and livable. New York City is not the first major city to move forward with pedestrianization. Istanbul, Turkey has made waves by pedestrianizing the majority of its historic peninsula on the Bosphorus Strait, a UNESCO World Heritage Site. Arequipa, Peru pedestrianized its busiest and most congested thoroughfare, cleaning up the air and helping small businesses thrive in the city center. A longer list of cities have experimented with different methods of temporary pedestrianization – including Bogotá, Colombia; Suwon, South Korea; Gurgaon, India; and even typically car-centric Los Angeles, United States. The common thread for each of these cities is the desire to give streets back to the people and reap the many benefits of living car-free. The video below, from 2010, highlights many of the efforts New York has made through PlaNYC to become a safer, more sustainable city. Many of these initiatives – like the Times Square pedestrianization and the introduction of a bike-share system – have since come to fruition. One decade ago, Times Square saw ten times more people than cars pass through its streets each day, yet 90 percent of the space was dedicated to cars. Today, a project is well underway that will return the equivalent of 1.5 football fields to pedestrians. Despite initial skepticism, Times Square’s pedestrianization has been viewed largely as a success and may prove to be an important part of Mayor Bloomberg’s legacy. This drastic shift in the way we value and design urban space is no doubt a trend to watch in 2014, as cities across the world take steps to revitalize public space and public life. Call it wishful thinking, but here’s a toast to 2014: the year of the sustainable city. What steps has your city taken to become more sustainable and livable this year? What do you hope to see in 2014? Let us know in the comments section!